For international admissions offices inside academic institutions, it is also clear that it has just become harder to make the case for studying at a U.S. university. Admissions officers and university leaders fear that international students and their families may begin to look elsewhere in the world for higher education opportunities, given the uncertainty surrounding the legality of the order and the possibility of additional complications for the freedom of movement of international students and scholars in the months ahead. Former Ambassador Asif Chaudhry, Vice President for International Programs at Washington State University, sees the Executive Order as a discouraging message for international students as they try to achieve their educational goals, a message that, given his own personal experience, resonates deeply. He grew up in a rural village in Pakistan without electricity or running water; attended elementary school in a field under a tree; and spent his afternoons with his father learning English. After earning a Ph.D. from Washington State University, he became an American citizen and went on to serve 27 years as a Senior Foreign Service officer in the U.S. government. As a senior administrator at WSU, his duties now include ensuring the global diversity of the student body at Washington State University. His advice to other academic institutions: While articulating the case for pursuing a degree at an American university might be more challenging these days, the advantages to both the student and the university remain the same. Nevertheless, parents, students, and universities all want to be confident that the experience won’t be fraught with stress, financial hardship, and tension for all concerned due to changing visa regulations. Students and their parents need additional reassurance that their chosen university is fully prepared to support the student throughout his or her academic experience. Increasingly U.S. universities are partnering with private-sector firms in order to work more closely with prospective students and parents from the outset; establish trust; and ultimately develop a vibrant, globally diverse and well-integrated campus community where students enjoy high levels of support. Ambassador Chaudhry made the following observations in our interview with him. Q: Has Washington State University seen an impact from the executive order since you are in the middle of the admissions application season? Ambassador Chaudhry: Before the initial executive order there was a growing concern among applicants as a result of all the rhetoric that went on during the election campaign. But we did not see a significant decline in applications at that time. I am concerned now, however, that the executive order, even in its second iteration, will have an impact on people from countries included in the order, as well as many others in predominantly Muslim countries. They will ask, ‘Should I go to another country like Canada or Australia?’ I just came back from a trip to South Asia, and students there were considering options other than the United States. Q: Our nation’s security is often cited as the reason for the travel ban. What will be the impact on universities in the United States if we limit international student enrollments? Ambassador Chaudhry: I have personally seen how rigorous the student visa process has become in recent years, especially in the areas currently in question. I can assure you that it is a time-consuming process that would meet most people’s definition of “extreme” vetting. I think we must remember, however, that it is very much in our national security interest to have students from other countries come to the United States and interact with our students. These students come to understand who we are as Americans. They take that message and positive experience back to their countries. Students who graduate from U.S. educational institutions are some of the best representatives and ambassadors for this country abroad. They spread the message that the United States is a good place. When graduate students come from abroad to work on research projects and activities, it pushes our own researchers and scientists to work together to meet those challenges. It broadens the depth and breadth of scholarly activity. At Washington State University, we bring global learning into the classroom by exposing domestic students who may not have traveled extensively to diverse populations including international students. This is often the first time they are exposed to people from other parts of the globe and it helps them to understand what other cultures are all about. It enriches their educational experience, as well. It helps us provide a transformative student experience (a part of WSU’s mission) for both our domestic and foreign students. Improving diversity is a key strategic objective for Washington State. It is a central component in what we call our “Drive to 25,” which is an effort to become recognized among the nation’s top 25 public research universities. Q: You travel the world promoting Washington State to prospective students and their families. Because of new Trump administration policies and the proposed travel ban for some countries, what challenges have you encountered and how are you dealing with them? Ambassador Chaudhry: Everywhere I go to there is an immense amount of interest in educational opportunities in other parts of the world. But sometimes prospective students don’t have support from family or the financial means to pursue that interest. Sometimes you have to educate the parents as much as the students about international education. And, one of the things we have been able to do is tell them the United States is a safe and welcoming place to learn in a calm and secure environment. I often talk about my own experience. After completing my Ph.D., I taught at Montana State University and then joined the Foreign Service and represented the United States in Poland, Egypt, Russia, Israel, Lebanon, Jordan, and as the U.S. Ambassador to the Republic of Moldova. I was able to provide an interesting perspective to friends and allies abroad of what the United States was all about. Being Muslim, I was able to represent the United States and say it’s a society that is diverse. I could say, “Look at me – the color of my skin, the accent, and the religion I follow, and the place where I come from.” I could say, “none of that matters in our society.” This personal narrative has a profound impact on prospective students. I am something of a poster child for this country – someone who literally came from nothing, emigrated to this country, and had the good fortune that I’ve had, largely because of the educational opportunities I had at WSU. When they learn of experiences like mine, it’s a huge encouragement for them, even now. Q: Your University recently partnered with INTO to attract a larger international student body. Do you feel outside partnerships are of growing importance? Ambassador Chaudhry: Absolutely. I think this partnership will help WSU mitigate some of the negative impact of the current political climate, but more importantly, will raise the institutional profile of WSU around the world. Because INTO has a 24/7 presence all over the world, we are able to showcase our globally competitive teaching and research. 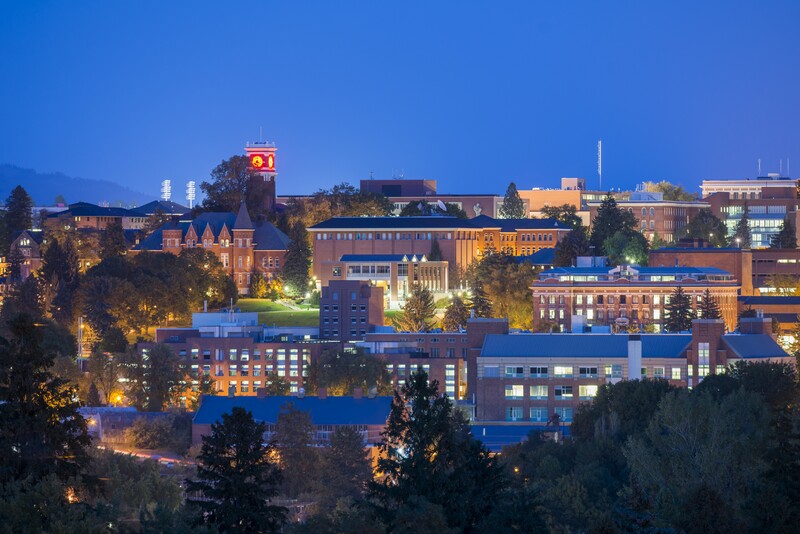 At the same time, we can identify high-quality students who can be admitted directly into Washington State, as well as others who may still need some additional academic preparation, including English language training, to prepare them for an education at Washington State. INTO has local offices in dozens of countries with staff who have built long-term relationships with local schools, parents, advisors, and communities. Knowledgeable representatives of WSU are always there; they speak with students and their families in their native language; and they can respond to any concerns prospective students might have as they navigate the often-confusing application, and visa processes. In large part, because of our partnership with INTO, students and their parents can be assured that WSU has made every attempt to anticipate and address the challenges that international students routinely encounter in studying in the US. They will be welcomed to a safe, secure, and supportive environment. The partnership represents a cornerstone in our wider efforts to continue to deliver these exceptional academic experiences and to offer students a secure, welcoming and supportive route through their degree programs. Q: What is your advice for attracting international students to US universities? Ambassador Chaudhry: I think universities must directly address the current recruitment challenges by proactively getting the word out that the U.S. remains a welcoming place for the world’s students. I travel around the world all the time and I feel I carry more responsibility, now more than ever, to explain to the rest of the world the values that truly define our university, our state and our nation. I would hope the heated rhetoric of recent weeks will soon fade into the background as more reasoned approaches to immigration policy are put forward. In the meantime, individual universities must find innovative ways to counter any negative public perceptions of America as an unwelcoming destination for students.